Montréal (Québec), June 30, 2014.– Quebec driver Antoine L’Estage (of St-Jean-sur-Richelieu) and his new co-driver, Torontonian Alan Ockwell, won this past weekend’s Rallye Auto nord-américain de la Baie-des-Chaleurs, the second round of the 2014 Canadian Rally Championship. 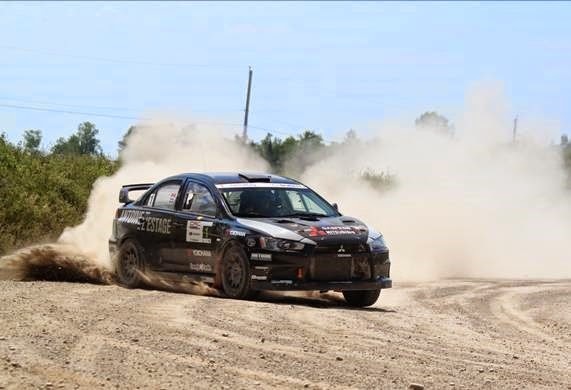 Antoine L'Estage and Alan Ockwell dominated from start to finish in intense heat and in front of thousands of enthusiastic spectators, giving the Yokohama Rally Team a second win in as many Canadian events this season. Winner of the Rallye Perce-Neige at the start of the season, Antoine L'Estage was contesting his first national event with the multi-champion co-driver Alan Ockwell. Confident that they work well together, they headed into the rally with determination : "we attacked hard right at the start. The goal was to build a big lead during the first few stages and that’s exactly what we did" explains Antoine. "At the end of the first day, we had more than three minutes on our closest rival, which allowed us to just manage the situation going forward" added the Quebec driver. The Yokohama Rally team won eighteen of the twenty-one stages that made up the event in Gaspésie this year. "Our winning gap might give the impression that it was an easy victory but Baie-des-Chaleurs is never an easy rally. Plenty of things can happen. This year, with the heat and the demanding roads, I had to stay very concentrated and I needed a reliable car. I want to thank John and Matt and the entire team, including Gaspésie Mitsubishi and Yokohama Tires because finishing this type of event without any flats is one of the keys to success" noted Antoine. For the already six-time Canadian Rally Champion, this win, his sixth at Baie-des-Chaleurs (new record) is obviously excellent for the championship. Antoine L'Estage is eyeing a record seventh Canadian championship title this year and has already recorded maximum points so far after the first two rounds. Antoine L'Estage, Alan Ockwell and the entire Yokohama Rallye team would like to wish long-time rival, Patrick Richard, a speedy recovery and they hope to have him back in competition for the third round of the Canadian Rally Championship, the Rallye Défi in Ste-Agathe-des-Monts, Quebec on September 5 and 6.